God's ways are perfect and so is His timing. Every. Single. Time! This week two words really stood out to me about this verse- TRUTH and HOPE. First of all truth. In a world of lies, deceit and sinful people it is often hard for us to trust the people around us. Sad, but true. Even if they are not specifically trying to be dishonest, our sinful nature gets in the way. 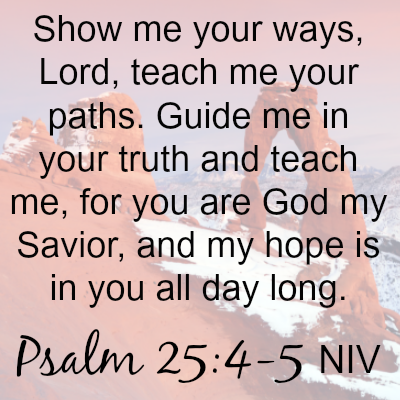 My prayer this week is that I will learn to trust people more, but more importantly to trust God. He is never deceitful. I just need to listen. And then there is hope. Do you have any? I needed some this week and a little bit shone through and it washed over me like a refreshing rain. Reminding me that God IS hope and that again, if I keep my eyes on Him and not the confusion and madness of the world, He will supply. Just the right amount at just the right time. Why would I doubt? I certainly do not want my children to doubt. I want to teach them that God is our hope and we need nothing else. Let's share this verse and watch our lives be changed! Anyone else out there who struggles to get kids to learn math facts? Anyone else tired of chanting facts and answers, tired of whining and complaining? While it is a necessary skill, I find it is one of my least favorite things to teach. Sometimes, it is nice to be able to pass the learning and responsibility into their hands and see what happens. That is just what I was able to do with the help of UberSmart Software. 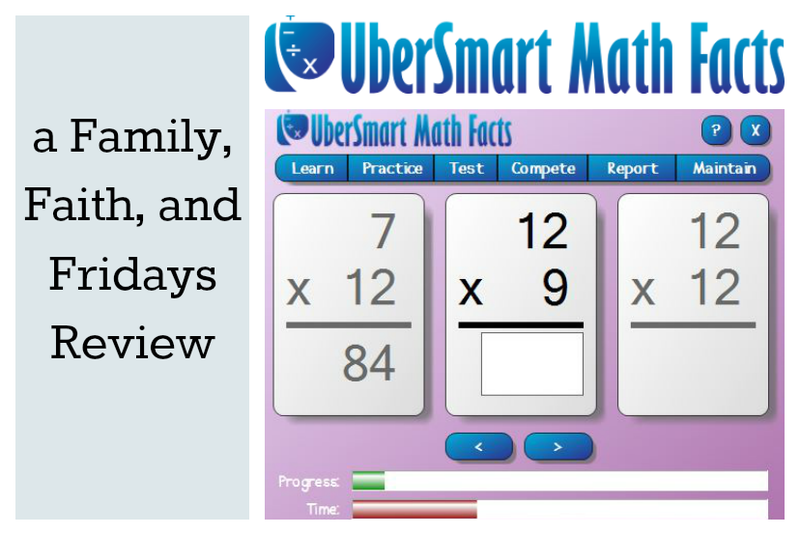 UberSmart Software offers a downloadable software called UberSmart Math Facts that takes the teacher out of the equation and helps teach math facts on the computer, simply and efficiently. Devoid of bells and whistles, this straight to the point flash card system is geared for kids grades K-6th or anyone struggling with math facts! Dot Cards (think adding dots on a domino)- This is a great way for visual learners to see what the numbers represent, but I must admit was our least favorite part of the program. I found that instead of committing to memory the facts, CJ began just counting without giving it any thought. There is a choice to have the actual number visible on the card, but then it got confusing for him for some reason. Keyboard Entry (10 key numbers)- This is the simplest mode and simply about a child learning to use a keyboard. They see the number displayed and enter the number in. If you have a child that is unfamiliar with a keyboard this is good practice. I also think that if you had a child who struggles with transposing numbers, this could be good practice for them. My boys do not fall into either category and therefore deemed this mode boring. Go figure! Flash Cards (addition, subtraction, multiplication and division)- This was by far our favorite mode and eventually what we used the most. It works just like a flashcard. When you get a fact right, it moves on. When you enter an incorrect answer it shows you the correct fact. I am convinced that 10-15 minutes a day on this one alone will improve your child's speed and accuracy with math facts. I will admit, my boys did not love doing it, but they did both see improvement and the oldest admitted finally that it was a good way to keep up his skills. I like using this as a warm up to math each day rather than fact sheets. The addition and subtraction function goes up through the 9s, division and multiplication can go up to 20s. The dot cards, keyboard entry and flash cards all have a learn, practice and test mode. You choose the level- beginner or intermediate and then addition, subtraction, multiplication or division as well as which fact family you want to work on. In learn mode, you are simply practicing the facts. The computer will show you a flash card, you will say the answer out loud and then you click the show mode and you self check your answer. In practice mode the fact is shown and you have to type in your answer while you are being timed. A green progress button at the bottom shows you how much further you have to go. Again, while there are no bells and whistles there is clapping at the end and you can print certificates after the mastery of a skill. A word about the test mode- One of the cool things about the tests is that you can adjust the time limits on the tests, pushing your child to complete the problems with better mastery each time. It also has a detailed report you can access to see how long it took your child to complete each problem. Your child is able to skip a test problem and come back to it if they get stuck on one. For us, this was helpful as sometimes my kids tend to freeze up on timed tests. Overall, my boys were not thrilled with this program, but what child loves to practice math facts, honestly? The good news is that they DID see improvement, and for me, that makes a product worth using! 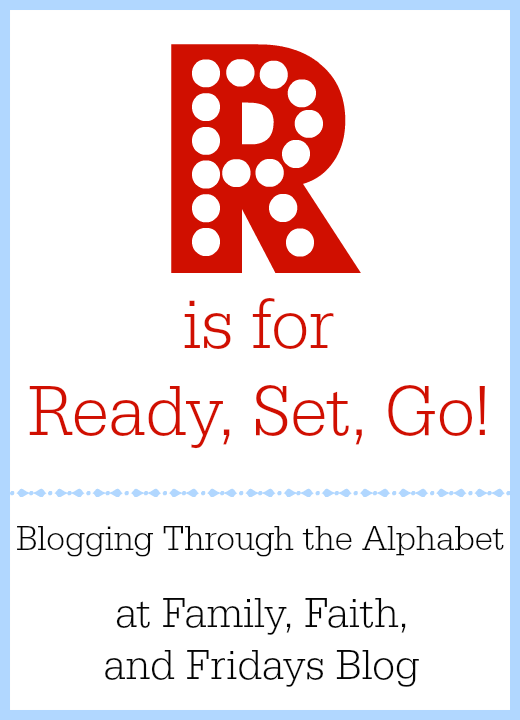 R is for Ready, Set, Go! It is time for school. While we normally school year round, we do take some longer breaks in the summer and lighten our schedule somewhat. I do want the kids to continue to think I am the best teacher ever, of course. 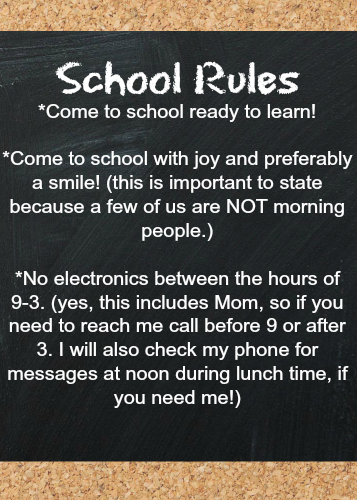 But today, we are back to a full schedule with a few new books and a few new rules. Most apply to the kids, but a few may apply to you so listen up! That's about it. Short, sweet and to the point. 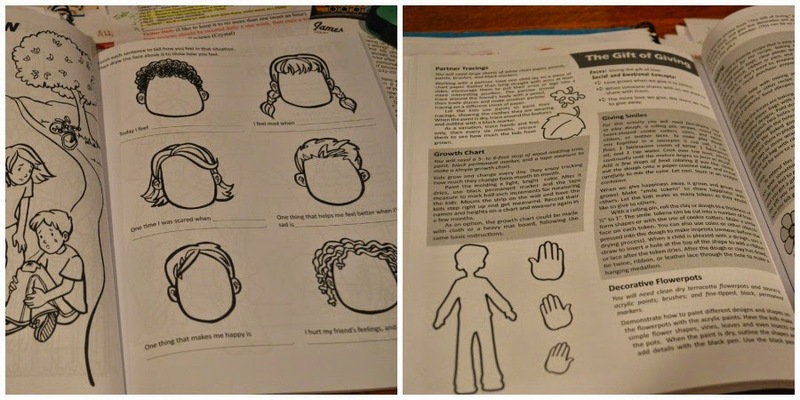 Remember, this is our 16th year of homeschooling, so we have this pretty well mastered. We are going to try something new this year. We will do school for 6 week increments and then take a week off to rest. Then repeat. It works out well for the first half of the year falling in line with a "fall break" with dad's schedule and Thanksgiving break as well. After Christmas, who knows- I haven't looked that far. (Can you believe it?) When our oldest was away at college we were very tied to her school calendar to make things work and it drove me crazy, so I am eager to try something new for a change. I will let you know how it works. For you homeschooling moms who have tried it this way in the past, I would love to hear how you made it work. Or if you have worked out the after Christmas schedule yet, please share! Regardless of whether your family homeschools or your kids go off to school, I pray this will be a blessed year for you. I encourage you to remember that while academics are important, families are more important. Love yours to the fullest each day and you will never be sorry! Join us as we blog through the alphabet with Marcy at Ben and Me! How good are your children at waiting? How good are you at waiting? Are you setting a good example for them? If I were going to be honest, might as well be, my answer would be not so good. and not so much. Waiting has never been my strong suit. I like answers. I like plans. OK, I LOVE plans. For tomorrow, next week and next year, please. Calendars and schedules keep this gal happy. And instead, I feel like this family is always in the act of waiting. For something. We are in that season now. Several unanswered "things" and lots of waiting. And on top of that be strong? Not for the world, or friends, or spouses, or the military (is that one just us? ), but for the LORD. Because He is the one that directs our paths and has all of the plans. 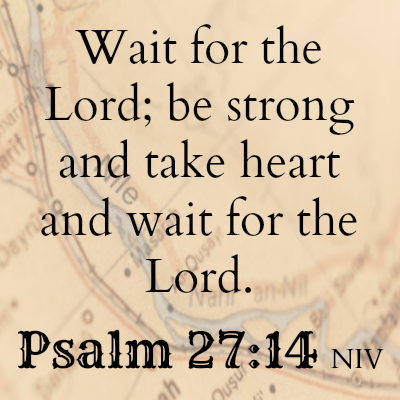 And if we trust in Him, we will wait for Him! How can we pray for you this week as you wait on God? How can you possibly say no to a product with the name Wizzy Gizmo? Yes, I admit, it was one of the first things that made me take notice of this company. The second was the fact that it offered a product called Audio Drama One- Who Created Everything? from the book of Genesis - chapter one. We love audio dramas in this house. We love the Bible even more. So combine the two, and I figured, hey, it must be worth a try. Wizzy Gizmo was co-created by Chris Del Aguila and Justin Cummins. I immediately liked them when I read that they were intent on keeping their products "thoroughly Biblical" and "thoroughly wholesome." They strive to keep to the factual word of God as well as avoid slang or unwholesome attitudes or language in any of their products. 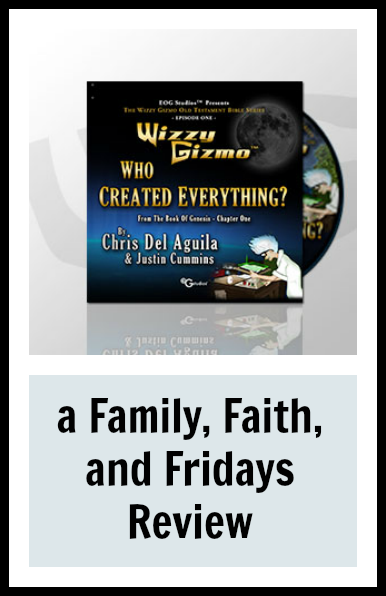 Created around the imaginary world of WizzyGizmo and his Gizmovsion machine, this audio drama tells the story of creation, one day at a time. When Wizzy and his friends put the Bible in the machine, they are transported back in time and are able to watch firsthand as God creates the world and all that is in it. This audio is advertised for ages 4-12, but with silly characters like a duck named Qwacky and a dog named Pepe, laughter abounds with lots of jokes and silly humor for any age. In between that humor you will find beautiful lessons of the six days of creation. Each chapter relies on the reading of scripture to tell the main part of the story, reminding kids exactly what the Word of God says. I love that. For our family, I do not mind presenting the Bible in a fun way, as long as it is clear that the Word of God is truth. I feel like Wizzy Gizmo does a great job of this. Sprinkled through the CD are songs with a wide range of appeal. From the "modern" theme song to the a silly song about mangoes, your kids will quickly learn the words and be singing along. Mine did, during a recent road trip we took. An additional 24 minutes of bonus material at the end includes 7 instrumental pieces that are beautiful. One of the reasons this stood out for me was I couldn't help it think it would be a great bedtime CD to listen to. After the 36 minute creation bible story, your kids can listen to the instrumental pieces to fall asleep. There is also a fun quiz at the end to see if your kids were paying attention! Our entire family enjoyed listening to this CD on our trip, but I have to admit our 7 year old loves it most. He has since taken it to his room and listens to it daily. Several times a day. Or more. Let's just say I am anxious for the second CD to come out! For those of you who have kids that prefer books, this CD is available in book form and the second book is also already available. You can read about those as well as the really neat Bible cards that Wizzy Gizmo offers, by clicking on the review button below. Overall, I have been very impressed with this product. This is a company I think we better keep our eye on- Wizzy Gizmo is up to great things! The audio drama Who Created Everything? can be purchased for $14.99. Some reviews, honestly, I beg for. And then there are some that just fall into my lap and end up being a big blessing in my life. Happy Kids Songs is one of those blessings! About the songs- Written by singer, songwriter and child and family psychologist, Dr. Don MacMannis, each album is packed with songs that teach children good life lessons such as sharing, caring for others, and being a friend. "Dr. Mac" is joined by fellow songwriter Brian Mann and together they have produced some fun kid's music. While he may not look familiar, I bet many of you parents out there know him already- he was the music director and songwriter for the hit TV show Jay Jay the Jet Plane! Just as my olders could sing that theme song by heart, my 7 year old can now sing these all by heart as well. How we used this- Originally, we just downloaded the songs on our laptop. Quite honestly, I thought we would simply listen to them a few times and move on. The best laid plans, so they say! In reality, what happened was that CJ asked to listen to the songs every day during school time. We finally compromised and let him pick 4-5 each morning. But then he continued to ask to listen to them. Instead of firing up the laptop several times a day, we finally burned the songs to a CD for him and he happily took it to his room to enjoy on his own. All. Day. Long. Several times I have asked him if he would like to listen to something different. "No, thank you" is the answer I get. 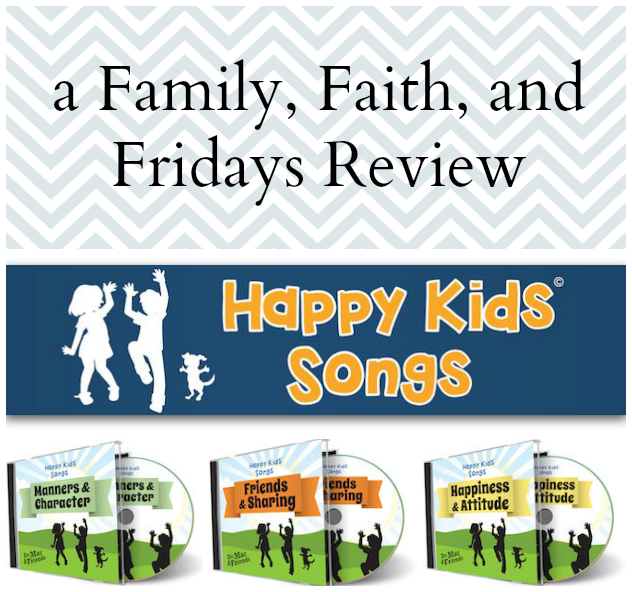 A quick word about the Happy Kids Songs Workbook. You will love these free downloads. (You can also buy the workbook!) If you have crafty kids, they will enjoy the coloring sheets and projects included. I can also see that these would be a GREAT resource for a small group setting such as Sunday School, or for a rainy day project in your own home. There are activities from crossword puzzles and word searches to writing about your feelings. In addition, each song then has a list of activities with instructions for group or individual play. While they are secular songs, the lessons taught could easily be tied to a Bible curriculum or any character training program you are using. I have to tell you I realized during this review that because he is the youngest of four kids, CJ has not been exposed to as many "kid" songs as his older siblings were. His love for these songs reminded me that kids need to be kids and have fun singing silly, "kid" songs. When they can learn good lessons from the songs- even better! We will be purchasing the rest of the set for sure! Sometimes life gets a little crazy and we need to stop, be still, and reset. Our family kind of hit that point this past week. There have been a lot of things going on in our lives, Not particularly bad things, but just lots of things- distractions that we allowed to take away our peace and our quiet. So we headed off last week to find it. Quiet, that is! In the past our family refuge has been the beach. But, hey, times change and well, we are living in South Dakota now. So off to the hills we headed! The Black Hills. This is our third trip there. Our second staying with an old friend and her husband. Darryl and Christy own and operate Spokane Creek Cabins and Campground. Whether you tent, RV or are looking for a cute little cabin to rest your head at night, this is a place you will want to visit. Thank you, Darryl and Christy, for once again giving us a place to reset and find some quiet! Despite having to come home a day early due to one family member being sick, we managed to have a great time. Good thing, because as of the writing of this post Sunday night (yes, I am a little behind) 4 out of six family members feel like death warmed over. I think I need another vacation. Day one was all about Custer State Park and the Wind Cave. CJ's one mission was to see Bison and some wild burros! Seriously, he is easily entertained. Especially when the burros will eat out of your hand and, I am pretty sure, would climb in your car if you let them! Saw some pronghorn antelope as well, just like the ones in our yard in Wyoming! Salem just wanted to see a different cave. This one did not disappoint. Since the Wind cave is a mostly downhill journey with only 11 stairs up, even I got to enjoy it. And the elevator ride back up! The 7 year old was just a tad tired, can 'ya tell? Back at camp the boys played by the creek and that night we enjoyed s'mores by the campfire, of course. Day two was spent at Sylvan Lake. Oh. My. Word! That could be one of my new favorite places. Pictures just do not do it justice. So beautiful! Do the rocks look familiar to any of you? Yes, that is the place where parts of National Treasure 2 was filmed. In addition, one can climb 'til you drop...so that is what the olders did. Have I mentioned these kids are slightly obsessed with rock climbing and bouldering? Luckily, there is also a great little "beach" area where CJ could swim while we waited. Day three- well, the drive home was not thrilling but necessary. And still quiet, since everyone was worn out from our two quick days. We enjoyed our quiet time, are laying low for the week recovering from illness and then forging ahead next week with our new school year. I pray you have had a blessed weekend as well, my friends, and that you too will seek quiet time when you need it. God will refresh our souls, if we will just allow Him to. And He doesn't need the beach or the mountains to make that happen! 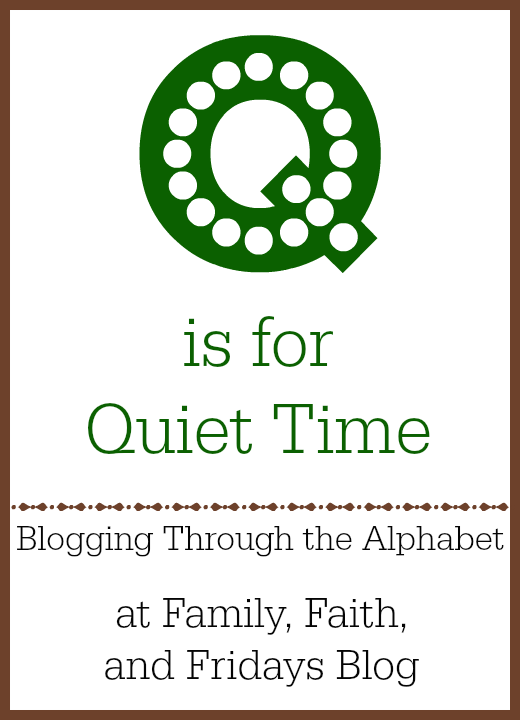 I never thought I would have so much fun Blogging Through the Alphabet! Hope you will join my friend Marcy at Ben and Me, along with many others as we have 9 letters to go! You Want Me to Teach High School? 9 Reasons You Can't Homeschool- Debunked! O is for Oh Shoot!